Lyndon! The Covered Bridge Capital of the Northeast Kingdom! Lyndon, VT., May 5, 2000 - "Welcome to Lyndon," declares the sign posted on Route 5 across from I91's exit 23 at Lyndonville: "The Covered Bridge Capital of the Northeast Kingdom"! 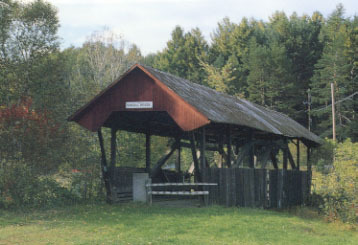 The Town of Lyndon is home to five covered bridges and host to the Lyndon Covered Bridge Ten-kilometer Volksmarch program. Aware of the importance of the old spans to the community, the Lyndon Area Chamber of Commerce and the Town have undertaken a revitalization program for their bridges and their sites. "I'm a retired park and recreation director," said Jim Fearon, a director of the Lyndon Area Chamber of Commerce. "So I was interested in travel and tourism. We formed a committee to take a look at the bridges and to form a preservation committee about four years ago." Mr. Fearon is the chairman of the Bridge Committee, the organization that has been the driving force in the effort to repair the bridges and improve their surroundings. "We have the vice president of the Chamber, Ellen Doyle, who runs Green Mountain Books," said Fearon, naming the committee members. "Harriet Fisher, author of several local history books and a member of the Historical Society; Craig Klemon, the Town Administrative Assistant; and Dr. John Elliot who is the owner and operator of Dartmouth-Hitchcock Medical Clinic on South Wheelock Road, right between the Chamberlin and the School House Bridges." 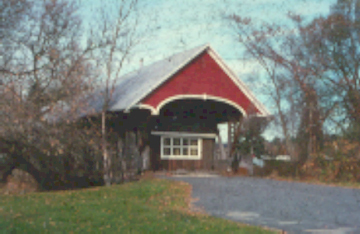 In November of 1998 the committee submitted The Lyndon Covered Bridges Preservation and Recreation Use Plan, covering The Randall, School House, Chamberlin, and Sanborn bridges. The Plan stated: "With the success in 98 of the Volksmarch program which was sponsored by the chamber hosting 200 visitors most from out of state we must continue to improve the general appearance of the bridges and make them user friendly. Parking, picnic tables, falls observation decks and interpretive signage can make the bridges an important part of the Lyndon experience." The plan listed improvement projects for each bridge and proposed responsibility for them to several Lyndon organizations including the Town of Lyndon Highway Department, the Rotary, the Grange, the Dartmouth-Hitchcock Medical Center, and students from Lyndon State College and Lyndon Institute. The projects for The School House and Sanborn bridges were completed in 1999; installation of roadside posts, topsoil and seeding, planting flower beds and trees at the School House Bridge; the repair of the siding and painting the portals of the Sanborn. "We have five bridges and it's been a struggle to get going on some of the projects," said Fearon. "I had a friend who was a bridge engineer for the highway department come and look at the bridges, particularly the Randall Bridge, which by the way, is owned by the chamber of commerce (The Town sold the bridge to the Chamber for one dollar). The town did a lot of work there, landscaping and regrading the area. "Our primary problem is with the Randall Bridge, it's the apparent undercutting of one of the abutments. The Chamber came up with about $400 to hire a contractor to tie some of the timbers together, to patch the holes in the tin roof and some other structural work on the bridge, but our next big project will be work on the abutment footer wall." A canoe and fishing access, and additional landscaping, including a picnic table are planned for completion this year by the preservation plan proposed this April: Work on the abutment is slated for completion by 2004, and further work on the bridge structure and roof is to be completed by 2008, these last requiring a grant and a fund raiser. "About ten students from Lyndon State College worked on the Sanborn Bridge," Fearon said. "They repainted the portals, repaired the roof and put used barn boards along the walk-side so the view from Route 5 is fairly good now. "We've involved the Dartmouth- Hitchcock Medical Center and Dr. Elliott with the planting at the School House Bridge; flower beds and some very large maple trees, and we have the Feed and Weed Garden Club based in St. Johnsbury coming up probably next week to do some additional planting. "The medical staff at the medical center has volunteered to do the painting on the School House Bridge to keep the bridge up. (The school building the bridge is named for now houses the medical center.) Dr. Elliott is interested in continuing the relationship with both bridges, the Chamberlin as well. It's really encouraging to see their interest. With the cooperation of the town we re-landscaped that whole School House area and limited the amount of parking on the west side of it. And the area is well mowed, done by a volunteer who lives next door. "We've put a picnic table in the bridge so that visitors there will have an opportunity to have a picnic lunch, and we'd like to do that at the Randall, too. "For the Chamberlin Mill, we're talking about additional visitor facilities including an observation deck to view the double waterfall under the bridge. It's an effort to get a little closer to the falls for the people doing the Volksmarch and for visitors that might come to look at the bridge. It's a 1790 mill site area and a lot of the original mill foundations are still there. We're looking at possibly some more off-street parking and some interpretive signs done through the Historical Society. The property by the bridge is privately owned so we're working with the owner to try to get at least a lifting of the limbs on the trees so visitors can observe the mill site better. "We are not sure what is going to happen with the Chamberlin, we had the natural resources people take a look at it and they are not happy with an observation deck intruding there, so the plans are up in the air at this point. "At the Millers Run Bridge, we hope to beautify the area to the north of the bridge with some tree planting and seeding. There is potential for canoe access there also." Asked if the general public in the Town has shown interest, Fearon replied: "The general public is involved with the Volksmarch Program sponsored by the Chamber. Last year we had some 217 out-of- stater's, some from as far away as the west coast coming in by bus for the Volksmarch, a ten-kilometer walk that takes in four of the bridges, the campus of the Lyndon Institute and the college. "Volksmarch is a national program; there are three or four marches in Vermont and about a thousand in the United States that operate seasonally year around. As far as we know we are the only one able to take in four covered bridges. Some of them come to see the covered bridges specifically, but mostly it's for credit on the Volksmarch. They get awards for completing a certain number of walks. We operate under the sponsorship of the Twin States Volkssport Association based in Middlebury." "The Chamber of Commerce here is adopting the slogan we just put on the new welcome sign right opposite exit 23 as you come into Lyndonville: 'Welcome to Lyndon, The Covered Bridge Capital of the Northeast Kingdom.' We're promoting the bridges at our information booth which is maned seven days a week during the summer months in down town Lyndonville. We have copies of the walk, directions to the bridges and a pamphlet to give to visitors." The Northeast Kingdom is comprised of three counties; Caledonia, Essex and Orleans. "There are those who would stretch those borders south to Cabot and west to Montgomery," said Jim Fearon, born and raised in Canaan, "But it just isn't so!" The architecture of the Lyndon Bridges is unique in Vermont. The Chamberlin, the Millers Run, the Randall, the Sanborn, and the School House bridges are all distinctive in appearance: wide flaring roofs with generous overhang at the eaves and gable ends. All but the School House Bridge use only the overhang to protect the trusses. 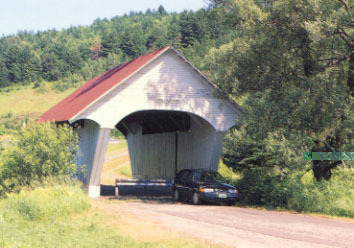 The School House Bridge is only one of two covered bridges in the state where the trusses are completely sheathed over. 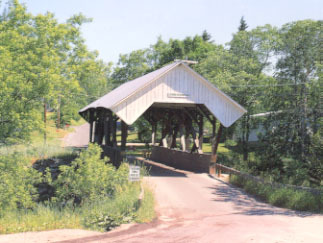 Four of the bridges are constructed using the queen post truss, the fifth, the Sanborn Bridge uses the Paddleford Truss, one of the last two authentic Paddleford bridges surviving in Vermont. The Millers Run Bridge was reconstructed by the Vermont Agency of Transportation in 1995.